Commercial dog food can contain non-human grade food ingredients, preservatives, and other unhealthy additives, and your pup requires excellent care if you want it to grow healthy and active. With homemade pet food, on the other hand, you can use only the healthiest and freshest ingredients with no preservatives or other additives. 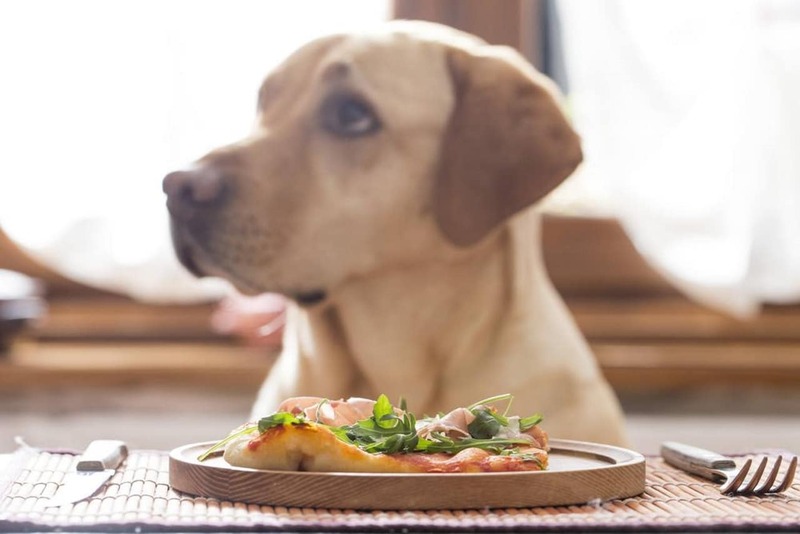 While preparing homemade food for your pet may sound like a complicated affair, we seek to offer simple recipes that are easy to follow and that will satisfy even the pickiest eater. What’s more, all the recipes you’ll find below are 100% natural and tailored to the specific needs that puppies have. Similarly, if you don’t have the time to cook food for your pet, but you wish your pup to have a natural and healthy diet, you can take a look at this article, where we’ve described some of the most popular organic dog foods currently available on the market. You might also want to check out some of our other posts, such as those on disaster preparedness for dogs or the one we’ve written on symptoms of worms in dogs. And while we’re on the topic of homemade recipes, maybe you should do a little reading on DIY chew toys you can make for your pooch. Our first recipe is straightforward, easy to follow, packed full of nutrients and will last you for a very long time. It is very similar to the natural food you can find available at your local store, with the added benefit of being 100% homemade and very cheap. You will need 2.5 pounds of fresh beef trim from your local butcher, 4 medium eggs, 4 medium carrots, 11 ounces of brown rice, and around 5 cups of water. You can start by placing the beef into a large saucepan where you can cover it with water – the water you will need depends on the size of the pan. Leave it to simmer until it is cooked – it should not take more than 15 to 20 minutes. Once cooked, you can remove the beef from the pan, but do not discard the water since you will need it later on. Get the carrots and chop them, and don’t worry about peeling them. The one thing to make sure is to remove the green tops off as they can be quite bitter. Get the rice and add it to the water you’ve used to boil the meat together with the chopped carrots. Let the water boil again until the rice and carrots are fully cooked and turning mushy. While the rice and carrots simmer and the meat has cooled a bit, you can chop it in smaller bits before processing them in the blender or the food processor. Make sure that you don’t overload the blender, or you’ll get chunks and mush. Begin to chop the meat until it is crumbly. Once you’ve processed all the meat and you’re preparing the final batch, you should add the four eggs and mix them with the meat until it looks like pâté. By now, the rice should have fully swollen, and the carrots should be tender enough. Get a stick-mixer and blend the rice and carrots together. Make sure that you don’t blend the mixture too much, just until the carrots have combined with the rice while giving the mixture a pleasant orange color. You can now add the meat and egg blend into the rice and carrot mixture. Combine them, and you’ll get the finished product. From the finished product, you should form baseball-sized lumps and place them on greaseproof paper. Each ball should last your pup for at least two meals. You should put them in the freezer and let them there until they’re frozen solid. For easy storage, you can use a few freezer bags and label them accordingly to know what the food is and when it was made. You should get about 40 servers, enough for around 20 days if you only have one dog, and once frozen and bagged, they will be safe to eat for a whole month, but we doubt that your pup will let them last for that long. Puppies require large amounts of protein to remain healthy, active, and to grow and become the adults that they’re meant to, and your canine pal should get most of its protein from whole meat sources such as the fresh chicken and beans in our following recipe. This recipe manages to blend chicken, vegetables, and beans and create a mix that is not only tasty but also very healthy. 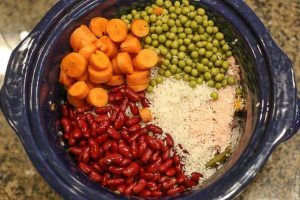 You will need 4 chicken breasts, 1 cup of black beans, 1 cup of kidney beans (both cups must be drained), 1 cup of diced carrots, half a cup of tomato paste, and 4 cups of chicken broth. First, you should cut away the excess fat from the chicken breasts and dice them into nickel-sized pieces. Start to cook the chicken into a non-stick skillet over a medium-high flame until it is no longer pink. You can then add the chicken together with all the other ingredients we’ve listed above into a large pot and cook over medium flame until everything is adequately heated. It should take around 10 minutes. Now you should allow the mixture some time to cool before serving, and you can store the leftover in the fridge for up to five days. To help strengthen the immune system and promote healthy skin and glistening coat, you can add half a tablespoon of fish oil to the recipe since the other flavors are strong enough that your pup won’t notice the added ingredient. How about preparing some homemade biscuits to help you bond with your pup and help it learn new tricks? This simple recipe has only four ingredients. You will need 2 and a half cups of whole wheat flour, 2 or 3 cups of pumpkin puree (fresh or canned), 2 large eggs, and 3 tablespoons of peanut butter. First, make sure to preheat the oven to 350°F. Now add all the ingredients in a bowl (a stand mixer is recommended) and mix them all until they’re combined. If the mix ends up being too dry, you can add some water, and if it is too wet, you can add some extra flour. Once the dough has the right consistency, knead it together on a clean surface and roll it out thin (1/8-1/4 inch thick). Cut the dough into small squares (or any other shape that you prefer) and transfer the biscuits to an ungreased baking sheet and let them bake for around 25 to 30 minutes. Let the biscuits cool down and store them in your favorite dog treat jar. If you feed your dog like this, you’ll make sure that you keep him or her healthy and happy for as long as possible. Just make sure you respect the regular de-worming schedule and protect your companion from roundworms and other types of parasites.